Shenoa Carroll-Bradd is a very gifted writer with an absolute boatload of ideas, interests and ambition. 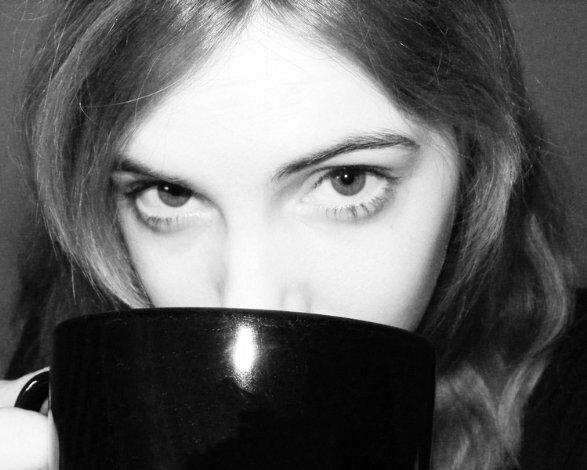 She writes short fiction, screenplays, graphic novels – you name it. If words can make it happen, Shenoa is interested in making those words. She also has a tremendous sense of fun about her as a writer, perhaps best exemplified by the project she mentions in question six: Lightning Lord and the Duplex of Death. 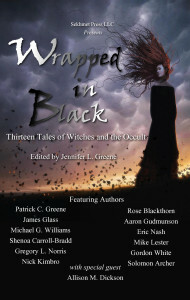 Her story “She Makes My Skin Crawl” in Wrapped in Black: Thirteen Tales of Witches and the Occult leapt right out of the page with its immediate sense of tension and foreboding and I absolutely adored it. Shenoa: My opinions on magic hang in this weird grey space, with my love of science and natural skepticism on one side, and an undying desire to believe on the other. Most of the “practitioners” I’ve read about seem laughably deluded, but there is still a lot in this world that can’t be explained, and much we still haven’t discovered. Magic, ghosts, and gods occupy the same dubious realm in my opinion. Yes, it would be fantastic if they existed, and maybe they do, but I just don’t see the proof. Shenoa: I’ve always loved stories of any kind, but the tales that really got under my skin and stayed with me were the scary ones. I love the thrill of being safely scared, and reading about gruesome, horrible things that can be closed and put away when I’m done. And to me, the stomach-twisting, adrenaline-tinged chills I get from horror are just as delicious as the butterflies of infatuation, with a far lower chance of disappointment. Shenoa: Sometimes I get epiphanies in the shower, cliché as that is. Mostly though, things click into place while I’m walking my dog, which is helpful, but inconvenient. Countless walks have left me muttering a plot point over and over so I don’t forget it before we reach the house, and I’ve startled our neighbors a few times by testing out dialogue, assuming I was alone. Shenoa: Much as I love horror, my answer is actually “The Last Unicorn” by Peter S. Beagle. I grew up watching the movie, but only read the book a couple years ago, and it is absolute magic. It’s a miracle. It’s my very favorite book now, and I recommend it to everyone. His voice is so enchanting, and the turns of phrase are startling and fresh, even though it was written decades ago. Some day, if I’m very lucky and work hard at it, I hope to write something with a fraction of that power. Shenoa: Just one? That’s tough. I’m going to say Neil Gaiman, and while he would surely get tired of my questions about Sandman and his marriage to Amanda Palmer and my incessant requests for stories, he seems like he’d be too polite to tell me to shut it. Though, now that I’ve typed it, getting Neil Gaiman to tell me to shut up might be a new life goal. Shenoa: The project I’m currently focused on is a steampunk superhero novel I just successfully Kickstarted: “Lightning Lord and the Duplex of Death!” It’s probably the silliest thing I’ve ever written, which has been incredibly fun and freeing. I’m feeling audacious enough to say it has hints of Terry Pratchett and Neil Gaiman (with a hearty dash of Spiderman and some Batman sprinkles). It’s coming out on Amazon in early 2015, barring tragedy or divine intervention. In the meantime, I can probably be found procrastinating on Twitter @ShenoaSays or Facebook.